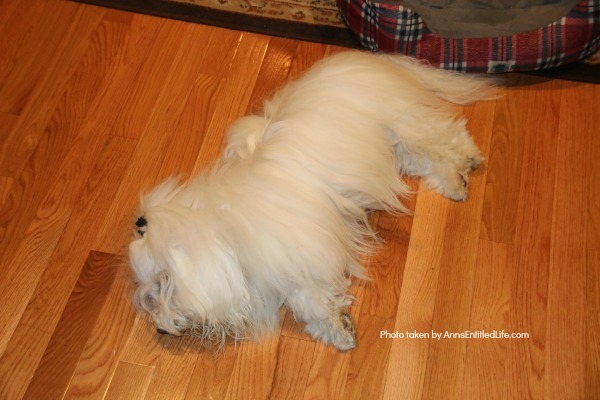 In July of 2014 Max, our (now) nine year old Coton de Tulear was diagnosed with GME. I’ve written about his progress extensively, here and here and here and here and here. This is the original post where I detailed the trail to diagnoses and remission. I have not had a blog post update on Max’s GME since October, 2016. As they say, “no news is good news” and he had been doing quite well until October, 2017. If you subscribe to the Ann’s Entitled Life newsletter, you have read a few updates about little Max. In October 2017 he again suffered what was thought to be a GME relapse. We made a trip to Cornell, his Prednisone was increased, his CycloSporine was raised a touch, and we hoped all would be well. A few days into January 2018 we began to notice increased circling from Max. He would still stop if I commanded him to, but the circling did not abate. We took him to Cornell on January 11, 2018, and his resident neurologist – Dr. Sarah Stephan – as well as her neurology supervisor (a chief of neurology), indicated a relapse. Max was sent home with a huge increase in Pred (10mg), Pregabalin (for the pain), and instructions for us to watch him, and lower his Prednisone dose to 7.5mg in 5 days. The hope was we would reduce that 7.5mg dose to 5mg, and we would reduce the Pregabalin to one per day when he dropped to the 7.5mg, and less than that at 5mg. The positive to the Prednisone – which is a synthetic corticosteroid drug – is that it is particularly effective as an immunosuppressant drug. And Max’s immune system needs to be suppressed at all times. He does not get any shots, and he does not receive kennel cough. Nothing to ramp up his system in any way. Since Prednisone is a steroid it can have longterm side effects including bacterial infections (he had a nasty skin infection last year which he needed to have a pet dermatologist treat), and weight gain. As anyone who has ever taken a steroid knows, you want to eat and eat and eat and eat. Max is here. Now along with a voracious appetite, Max also gains weight while on the Pred. 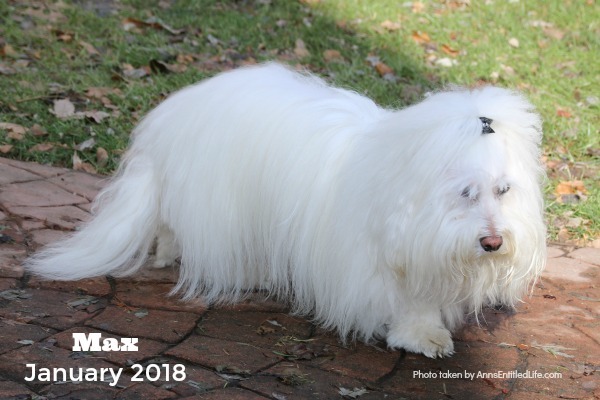 It takes a while to get that excess weight off him once the Pred decreases, and he is an unhappy doggie at 17 pounds or more. This time, with the pred increase we had him weighed at physical therapy (where he is weighed weekly) as well as his regular vet (where he went for a blood test). They both showed him losing weight with the steroid increase. On the higher doses of Pred Max was not responding as he has in the past. The circling increased and got tighter. There were neck stretches (a sign that he was trying to relieve the pain), and when we tried to reduce the Pregabalin there were obvious (and loud) signs of pain from him when we tried to give him oral medication (he flails his head to get away from me every time (3.5+ years now)) and was now causing himself pain in doing so. Mr. Max surveying his domain before we left Sunday morning. As to the non-weight-gain with the Pred? We were told it wasn’t as unusual as we assumed. I am keeping Max home from physical therapy this month. We had planned a long road trip for the end of January and February, so I had nothing scheduled for him anyway. (That trip was canceled when the chemo became necessary.) His next PT isn’t until March, and by then he will have several chemo treatments behind him and should be feeling more like himself (I hope). 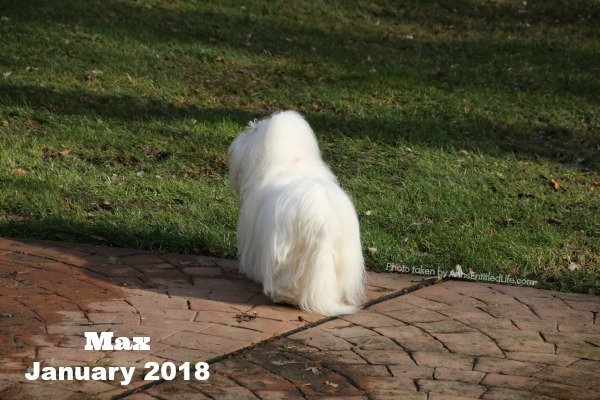 One of the things I keep telling Hubby – and that was reinforced (kindly) by the two neurologists we saw at Cornell this month – is that Max is well past historic longterm prognosis for this terrible disease. When he was diagnosed it was “not leaving the hospital” – to – “up to three years”. Max is now at 3.5 years. Both neurologists also made mention of how remarkable this is. Mr. Max resting comfortably inches away from one of his (many) beds, Wednesday morning. I have no idea how much longer we will have the little guy with us. To date, he has been extremely tough in battling this truly terrible disease. He’s set for several more chemo treatments, and we are hopeful this will zap that crushing inflammation and Max will truly be a medical marvel. We do know that, since Cornell is a teaching veterinary hospital, his treatment therapy could be of help to future dogs that come down with Granulomatous meningoencephalomyelitis (GME). We are just thankful for every day we have with him. What a tough little guy! I hope that the chemo will work wonders and you’ll get much more time with him. So thankful he has parents that are able to be so thoughtful with his care and observant to his needs. Keep up the good work! I am very happy to know Max is doing well. Do you use any homiothetic medicine in addition to cytosar treatment? If so, please let me know? Nope. You have to kill the inflammation, and I am not sure anything but chemo can zap his flare-up. However, I am not a pet neurologist. You should consult one for your beagle. And best wishes for your pet making remission (there is, sadly, no recovery). Veterinary Neurology Hospital. After four days of stay, she is back home. Since then, she has not had any convulsion, and she is receiving Cystosar treatment now. I trust modern medical approaches. I am so glad your Hana is doing better!!! I hope she continues to do well.